Jumper Alyssa Elliott spark the Rams with a win a league record in the triple jump with her winning mark of 37-7 1/4, she would add 10 more points in the long jump with a leap of 17-1. Elliott's mark in the triple ranks her second in Class "A", and fifth best in Maine indoor history. Senior Sofia Wittmann added a win in the pole vault clearing 10-0, while sprinter Naomi Noack was tops in the 55m dash in a time of 7.80. Brewer's Morgan Honey dominated the 55m hurdles as she sped to a winning effort of 8.83, she also won the 200m in a personal best 27.46 and added a runner-up finish in the triple jump with a another personal best effort of 35-2 1/4. The Broncos of Hampden Academy cruised to a team title in the Large School PVC-EMITL Championship at the University of Maine. 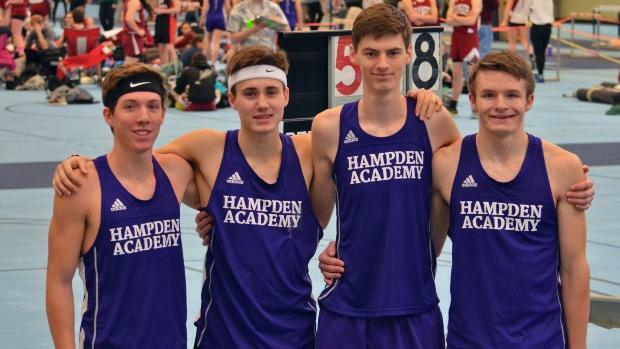 Hampden Academy tallied 134 points to win by 20 points over the Rams of Bangor. Hampden was paced by distance runners Wyatt Lord & Jason Mathies. Lord won the mile (4:32.27) and 800m (2:04.70) and was the runner-up in the 2 mile (10:11.50). Mathies took the win in the 2 mile (10:03.88), and was a shadow of Lord in the mile (4:32.72) and 800m (2:04.94) taking second in each race. The duo combined 52 points. Wade Brown was the only other winner for the Broncos as he jumped 42-0 3/4 to win the triple jump. Hermon's Zach Beaton won the 55m hurdles in a time of 8.14, he added a second win with a 6-0 clearance in the high jump. Landyn Francis of Bangor was a double winner as he clocked 6.74 to win the 55m dash, he would add 10 more points with a 53.45 winning effort in the 400m. He also finished as the runner-up in the 200m running 23.71.